High quality flat pouches come in a wide range of sizes for packaging smaller sample portions of your products or larger quantity items for storing purposes. 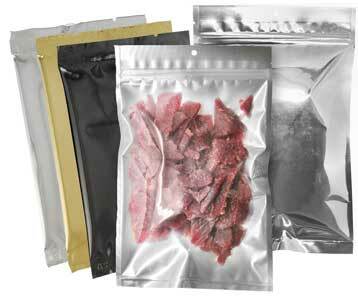 Some stock pouches also include a hang hole, a resealable zipper making them ideal beef jerky bags, portion-sized coffee bags, or any perishable snack item. Add a degassing valve to turn these into portion sized coffee bags! Flat pouches are available as custom printed bags (flexo printing, hot stamp printing) and for applying custom labels. 3 Side Seal Flat Pouch - 5" x 8"
3 Side Seal Flat Pouch - 7" x 11"